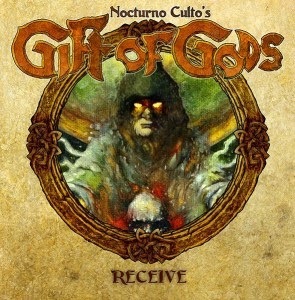 Gift of the Gods is a side project from the incredibly talented and prolific Ned Skjellum, half of Norway’s extremely influential black metal band “Darkthrone.” It’s a thirty minute EP release on which Nocturno performs all tracks, and all instruments himself. It was also recorded at Nocturno’s own studio, with his “musical partner in crime” KA Hubred assisting with practicing and rehearsing over a two year period. Developed as a “labour of love” over many years, Receive finally gets its release via the Peaceville label and it has been well worth the wait. Nocturno draws many influences from his vast career to hone this extra special concoction of straightforward, up-front, head banging heavy metal. Opener “Enlightning Strikes” begins with a moody, atmospheric intro laced with spooky effects and industrial tones, from here it’s straight into pure, unadulterated heavy metal bliss. Straight up mid pace heavy metal riffing introduces us to Nocturno’s take on the genre. This is a fantastic track that spans close to nine minutes yet never, ever feels stretched, Culto’s accomplished guitar work is prevalent and many outstanding guitar solos impressed me throughout this epic, fantastic metal trip. Title track “Receive” follows, it’s an instrumental piece laced with quality riff after riff punctuated with more outstanding guitar solos, vocals aren’t missed in the slightest as Nocturno quickens, then slows the pace at will. “Looking for an answer” is an odd inclusion – it’s a cover from 80’s metal band Universe, yet it works perfectly well; it’s a faster, upbeat piece and illustrates Nocturno’s clean vocal abilities more so than the other tracks within this excellent EP. Closer “Last Solstice” is a slower, doom influenced affair, a welcome return to Nocturno’s broodiness following the previous cover track it’s another colossus lasting more than seven minutes. Doom influenced riffs abound during this moody, menacing piece that again showcases exceptional guitar solos from Nocturno. I really, really enjoyed this it’s thirty minutes of sheer skill filled heavy metal bliss. Yes, there’s enough doom and even black influences to please Nocturno’s fans of old but it’s undoubtedly a straight up, honest heavy metal release that should garner him a more widespread audience. If you like metal you must hear this, its exceptional value for an EP (25 mins) and the fact that it’s predominantly the work of one musician from start to finish makes it even more impressive. An unexpectedly brilliant gem of a release from master of the black arts Nocturno, Receive is a heavy metal joy to behold from start to finish I can’t speak highly enough of this and cannot fault it in any way, definitely one of the best, and most important releases of 2013. As an EP, and first release, it has to be 10 out of 10; let’s hope a full length follows and is as excellent as this. Receive is available now through Peaceville Records on CD and Vinyl.